Manchester Long Stay Car Park 2 - ZONE A. 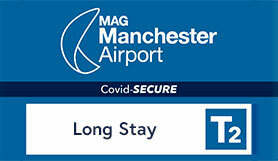 If you'll be away for a week or two, Long Stay offers unbeatable value for money and convenience. Disabled parking bays are available, please email us if you require any further information. Please note the transfer bus only serves terminal 2. As part of the £1bn redevelopment of Manchester Airport they are making some changes to the facilities in and around Terminal 2 over the next couple of years. These will include some changes to where passengers drop off, pick up and park, along with some minor alterations to the road network. From Thursday 19th October 00.01, the departures forecourt at Terminal 2 will no longer be accessible for passenger drop off. Passengers will be directed to a new departures forecourt which will be located on the ground floor of the multi-storey. Please note that the height-restriction for this drop-off facility is 2.0m Vehicles above this height can use the over-height car park or other suitable car parking products. There will be plenty of signage directing you but please leave some extra time for your journey if you are not familiar with the airport layout. Passengers who require a disabled bay in the multi-storey car park will find them located on levels 1, 2 and 3. Drive to the exit, the barrier will lift automatically. If prompted for over-stay payment use integrated chip & pin device. Proceed straight on past the multi storey car park. At the next roundabout continue straight on again, then turn right at the T-junction. Continue straight ahead, following signs for Long Stay parking.